Joining in again with Leslie and the plan to jot down one sentence a day to journal our months. Day 1: I can officially say that I am leaving work 'this month' and can easily count the number of working days left - 14 (not that I'm counting 😉). Day 2: What a miserable wet, dark day - having to plan indoor activities to occupy Leo is much harder than when you can get out to spend time at the park. Day 3: Back to Fitsteps tonight, I don't seem to be able to find an excuse not to go as I have done a full inventory of body parts but can't find anything that hurts/aches/feels a bit dodgy - it'll be fun when I get there, it's just the getting changed into gym clothes and leaving the house that's the hard part. Day 4: An impromptu message to friends to see if they were free resulted in a fun evening sharing a couple of bottles of wine and enjoying a lovely warm evening sitting in the conservatory. Day 5: A day of 'firsts' - had to use the air con in my car for the first time this year, also heard the sound of 'leather on willow' for the first time this season as the local cricketers did their final training for the first of their home matches this weekend (living so close to the local cricket field can mean that we find random cricket balls in our front garden when the batters have been overenthusiastic!) 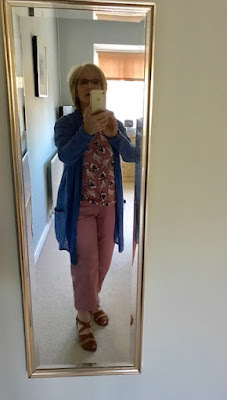 and I was pleasantly surprised, when I was looking for an outfit to wear when we went out for dinner in the evening, to find I was able wear two separate new purchases - pink crops and blue cardigan - for the first time when I discovered both colours matched a linen top I already had in my wardrobe. Day 7: Bank Holiday Monday and we were still basking in glorious sunshine so no excuse for not tackling the garden all day, despite the fact we know we will suffer aches and pains tomorrow. Day 8: They interviewed applicants for my job today - it's all getting a bit real now, I wonder who will be sitting in my desk this time next month? Day 9: We spent nearly all day outside with Leo in the hope that all the fresh air would tire him out and it did, after walking round to drop Coco at the groomers he had a lovely long nap while we had a restorative cup of tea in the garden. Day 10: They can't decide who to give my job to - they have two people out of the five they interviewed that they are particularly interested in. Day 11: Husband flew out to Portugal with his badminton buddies as one of them is getting married in June, I suspect they will be the oldest 'stags' in Albufeira! Day 12: Eurovision Song Contest - a protester ripped the microphone out of the hands of the UK performer (my friend's daughter!) - I think everyone watching in the UK couldn't believe what they were seeing. Day 13: I had overnight guests in the form of Leo and his mum as his dad was out for the night and they thought they would keep me company. Day 14: Husband returns from stag weekend, slightly hungover, hungry and tired - I think he's realised that he's too old for 'lad's weekends'. Day 15: Starting to prepare all my handover instructions for the person taking my job - coincidentally they have given it to the sister of a friend of my daughter, it really is a very small world! Day 17: Made it to Fitsteps this evening, they actually got the air conditioning working this week so it was a lot more comfortable dancing. Day 19: The Royal Wedding! Windsor looked beautiful in the sunshine and they made such a gorgeous couple. Day 20: Looks like our son and daughter in law's purchase of a house 12 miles away from us is going through and we took them out to lunch to celebrate - so happy they are moving out of London and closer to home. Day 22: Desperately trying to get all my work up to date ready for my last day on Friday. Day 23: Today we took delivery of a new large sun umbrella for the garden - can I now apologise to everyone in England for jinxing the weather? Day 24: My first farewell gathering - my work colleagues threw me a farewell supper and I only cried once, along with a very generous amount of John Lewis vouchers, they had made me a picture with lots of memories of my 17 years at the school. Day 25: I was dreading today, as I knew it was going to be emotional but I managed to keep tear free until the very end - then went out for a delicious Indian meal with friends in the evening to celebrate my early retirement. Day 26: A glorious day in the garden and a bit of 'up cycling' of an old table Paul found hidden away under a shrub in his Mum's garden, we should have taken a 'before' photo to show the peeling varnish and decaying wood. Day 27: Got to love sunny Sundays spent in the garden, when you live in the UK you realise you have to make the most of every dry warm day because you never know what tomorrow's weather will bring. Day 28: Was on the hunt for a new series to start watching on TV and have decided on Safe which a lot of people have recommended - only one episode in but I think we're going to enjoy it. Day 30: My friend's daughter who was in Eurovision is playing a concert in our town in a couple of weeks and today I bought a ticket - it's so interesting to follow her rise to fame. Day 31: A day childminding - I'm not sure we should have taken him on a visit to the local Majestic (Wine Warehouse) but he was very well behaved and we managed to get out without causing any damage to displays - touch and go at one point as he's at that age where he cannot sit still when seated in the child seat of a supermarket trolley, arms and legs grabbing at anything he passes! So that's it for May - wow, this year is going by in the flash of any eye. Seems like there is a quite a lot planned already for June, tune in next month for the recap! What a bittersweet month. Sounds like you have settled right into retirement. It may still feel like a holiday or vacay at this point, though. I think after about two or three weeks, once I had recovered from the surgery that was the reason I retired, I was thinking it was time to go back to work. Will be anxious to see how you feel. If you want to pair up for a retirement post, let me know. Even after three and a half years, I am day to day on this gig. Lovely new outfit. It is wonderful when you can create an accidental outfit from pieces you hadn't bought together. I am thinking of doing the summer style challenge just because I dislike my summer clothes most of all. The gal running it always has the easiest ideas of breathing new life into your wardrobe. Glad your son and family will be moving closer to home. Sure wish my girls would do that. Well done managing a visit to the winery with your grandson in tow. Our babies always rise to the occasion and do well when we most need them to. Another great month captured in one liners ... if it's pink in any way, it's perfect. I like your new sun umbrella & good news for your son & wife moving closer & purchasing a home of their own. Yeah for May. 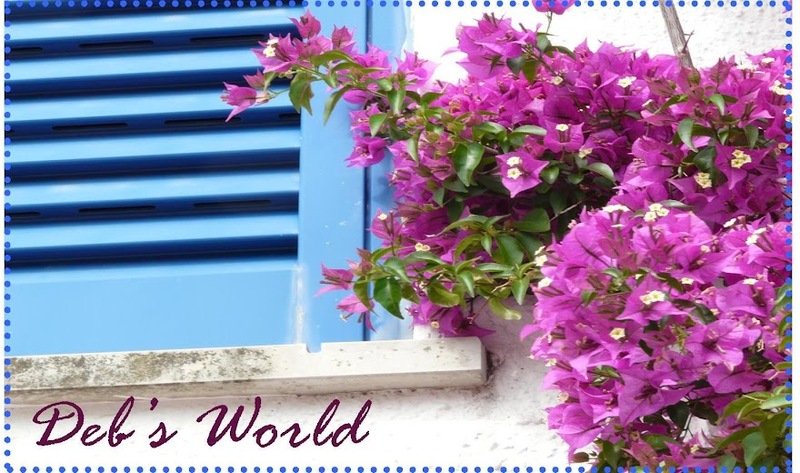 I love this monthly series of yours … lots going on! Wow fancy our Eurovision entry being your friend's daughter! I didn't see it but it seemed very unfair they chose our entry to disrupt. Enjoy her concert! It must be weird being at work seeing them hiring someone to replace you. My husband retired earlier this year but I have a few years to go, unless we win the lottery. I didn't watch the Eurovision, so I haven't heard about the incident but I imagine it must have been stressful for your friend's daughter....but still it's cool that the UK representative was a daughter of your friend. It's a small world. Wow, lucky you for retiring! I feel like I have ages to go...and not enough gas left to get there! That memory picture your co-workers made for you is so fun, what a great idea! I found your sentence-a-day post from Jodie Filogomo's Touch of Style blog.